Im trying to connect my Mac's computer and trackpad to my Lenovo Y-50. On my Lenovo I have downloaded Windows 32 bit. If I dont get a responce or help I would like a refund. I have the same problem. My Pc is a 64 bit version running as server and my Mac running client. 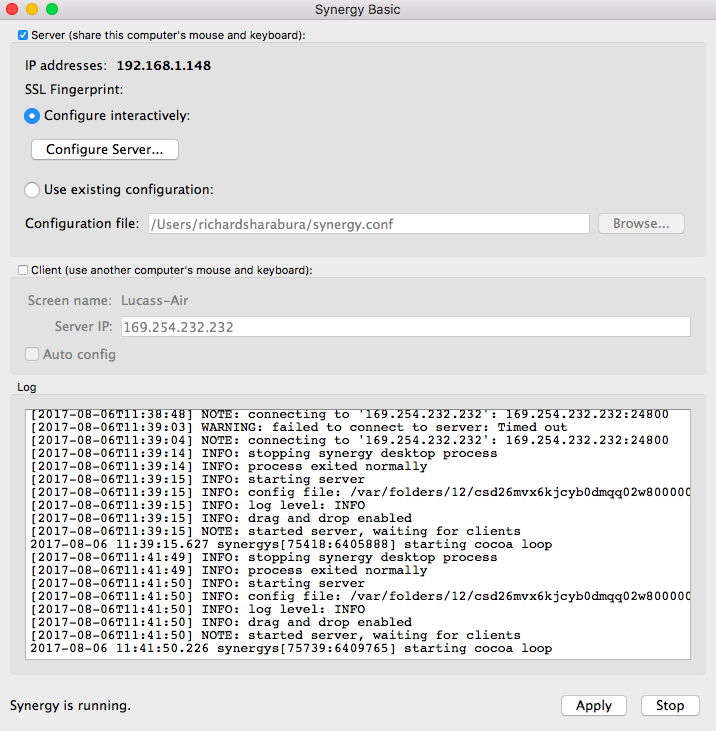 My Mac continues to try to reconnect to the IP and says "Warning: failed to connect to server: cannot connect socket: Host is down" and repeats over and over again. I keep using the IP address that my PC has, but to no avail. Hi @LucasSelzer. Please provide more details about your machines (OS, 32/64 bit, Synergy version installed, connected to the network via Ethernet or Wi-Fi, specify which one is the server). Also, post a screenshot of both machine's Synergy interface and the Server Configuration interface on your server machine.